“Suffield 1670” tee-shirts, recognizing the town’s 350th anniversary, are available on the Parks & Rec website. We have had an exciting winter season at Suffield Park and Recreation! Our efforts to bring programs that are more diverse to Suffield, and its residents, are gaining traction with full classes in a wide range of program categories including: adult fitness and wellness, youth arts and crafts, youth fitness, STEAM enrichment programs, self-defense and pre-school and adult sports. These new and unique programs are supplementing our traditional programs, such as youth basketball, bowling, and yoga. I would like to give a special thanks to the group that attended the Cupcake Decorating class that left some samples for me. The cupcakes were beautiful and delicious too…even if I had to do some extra exercising to make up for eating them! I cannot wait for the next candy making and cupcake making classes to try those samples! Parks & Recreation youth sports are made special by volunteers and staff that dedicate themselves to bring high quality programs to Suffield’s youth. While there are always areas for improvement at any level of sport or recreation, we made some structural changes to improve our basketball program this year. With these changes, and more to come next year to improve team parity, I am excited to work towards our basketball program offering quality instruction, games, and an overall great experience for those involved. Some of these improvements include working with the school department to continue to have great facilities, as they resurfaced the gyms at the middle school and McAlister this season; starting the season earlier than January; and submitting a grant to fund adjustable height basketball hoops at the Spaulding School. If we are fortunate enough to be awarded this grant, it will ease the gym space crunch during basketball season. While we have been busy running winter programs, and opening up spring program registration, we have been planning our summer (that’s right, summer!) day camps at Spaulding and Sunrise Park, specialty programs for all, tennis, soccer, basketball, and traditional summer camps. New this summer will be sport-specific camps for volleyball, and field hockey. Premier Sport Camps will feature top coaching at our facilities; a well-rounded curriculum of skill development, while keeping it fun; and the ease of registering through your Parks & Recreation account. Our Tween Adventure Camp out of Sunrise Park will feature two new off-site trips this summer. These special trips to Farmington River Tubing, and Brownstone Expedition and Discovery Park are sure to add more adventure to your summer! Be sure to keep an eye out for more information on our full slate of summer programs. Speaking of Sunrise Park, we have been working with the Conservation Commission, who oversees Sunrise Park, to update the upper playground at Sunrise. The new playground will replace the pressure treated wood structure, while slightly increasing the playground’s footprint. The new design will be nature themed, and will fit into the park’s beautiful setting. The new design will also have some features for the older children that may be utilizing the park during the weekends at family picnics, and parties. I cannot wait for you to see the finished project! Lastly, we will be celebrating “Suffield Night” at the Hartford Yard Goats on Saturday, July 13, 2019. There will be pre-game acknowledgements of Suffield award winners, a color guard comprised of members of our Police, Fire, and Ambulance personnel, and a Suffield resident is scheduled to sing God Bless America at the game. 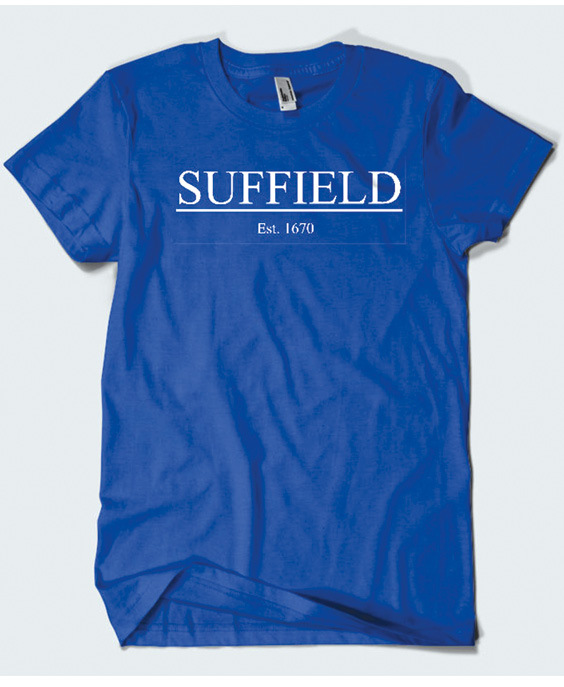 Not only can you purchase tickets through www.suffieldrec.com, while supplies last, you can also purchase our royal blue “Suffield 1670” T-shirt on the website. Be sure not to miss this fantastic community event; and to top it off, there are fireworks after the baseball game. I hope to see you and many Suffield residents at the game! Spring is finally here and The Parks and Recreation Department has a variety of fun, new programs for the entire family. For a full listing of our programs and to join in on the fun, please visit www.suffieldrec.com Be sure to also ‘Like” us on Facebook to stay up to date on events. Is your Middle-Schooler looking for something cool and fun to do after-school? The Parks & Recreation Department’s new Yoga program offers a great way for Middle school students to make new friends, learn to relax and practice proper breathing techniques to help alleviate stress. It is perfect way for students to end the school day and is for both boys and girls. Participants will build physical and emotional strength in a welcoming and fun environment. The program begins on Wednesday, April 24 and runs through May 22 from 2:20-3:15 p.m. in the Middle School Back Gym and will be taught by instructor, Amy Manning owner of Zag Fitness of Suffield. To register or for more info about all of our spring program offerings, please visit www.suffieldrec.com.